E4N Brass House Numbers match the Ecco E4, E5, and Ecco E7 mailboxes (all shown in Related Products) and may also be purchased separately. 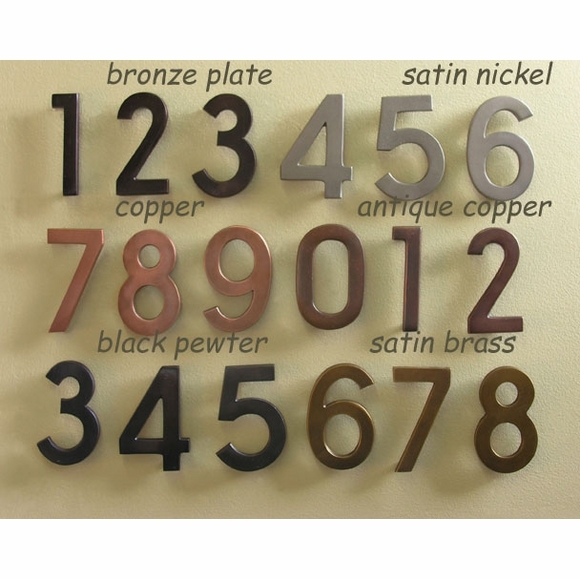 Architecturally elegant pin-mounted house numerals are designed for wall mounting above your ecco mailbox or independent of mailbox. Simple, bold digits are 4" high x 3/16" deep. They stand 1/4" away from the wall with no visible hardware (included). Please type the numerals desired (one at a time) in the designated box. If you need multiples of a particular numeral, please use the quantity box. Special order. These are beautiful, heavy, numbers. Perfectly match the mailbox. One of the numbers that I ordered arrived with several scratches, but one quick call to Customer Service resulted in a replacement being sent immediately.